Another week under my belt, and can I say TGIF?! It’s been a LONG week! I don’t know about you- but my kiddos have been driving me nuts, is that bad?! I think I’m ready for my vacation! If you’ve been reading this for a while, you may have noticed that I seem to really like the classic, preppy look! On the right I’m showing one example, but it doesn’t quite work. Although this jacket is cute- the collar is a little too large, and the cotton fabric (it’s like sweat shirt material) wrinkles so easily that it looks messy. On the left I’m showing an improved version. Even though there was nothing wrong with the plain blue shirt from the right- to add a little interest and pattern, I’ve decided to go with this cute checked shirt. I’m wearing it under my blue blazer, which looks more polished. I also have on my new favorite skinny jeans- Skinny Skinny by Madewell. These are incredibly comfy and they were around $100, which I think is reasonable (think price per wear- I wear my skinnys at least twice a week). They have so much stretch in them and the cotton is so soft, it is honestly like wearing sweat pants! Heaven! I’ve finished the whole look off with my brown boots. Now, is it too soon for Happy Hour?! I decided to tuck in my shirt for a cleaner look. For a more casual look I think this shirt is cute enough to stand on it's own. TGIF! Wish it was time for happy hour already too. 🙂 Can’t wait to see who are your guest bloggers while you are out! I should be packing for MAUI (woo hoo!) but instead I’m on the internet . . . Anyhoo, I love the look of the tucked in blouse with the navy blazer. I think the Lands End blouse needs a little alteration – something another reader of yours suggested. Can you take it to a tailor and have the sides “tucked” in a little to give it a more flattering fit? I don’t know the exact term but it makes it a little more fitted and flattering. It never occurred to me to take a boxier type blouse to the tailer for that simple alteration, but I LOVE the idea! 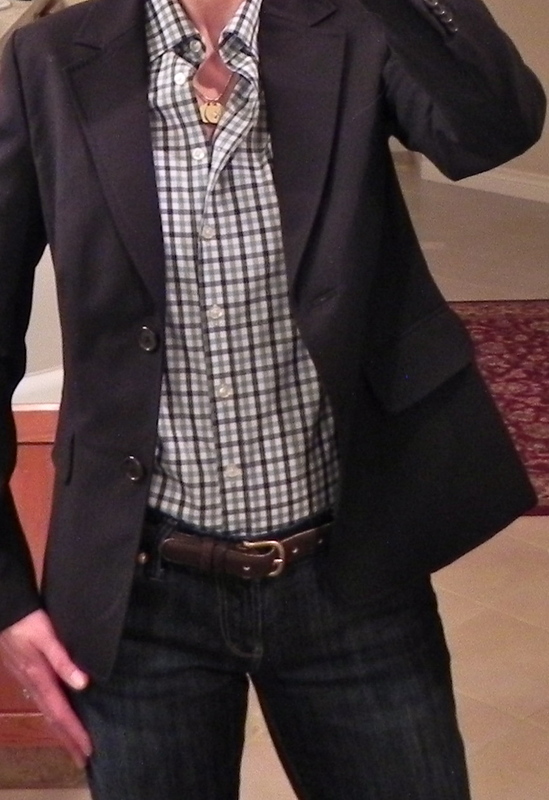 I love the feminine spin on “mensware” pieces like the plaid shirt and blazer. It looks SO cute! A little Annie Hall, without going over the top! I just got a new pair of skinny jeans from JJill. They were 80 but are on sale for 60 this week. They are very comfy! Thanks for the info! I always love hearing about what other people love, especially if they are on sale!